We do it because we are passionate about aviation (and soaring in particular) and because it makes lot of fun! Among us there are people of different professions and skills. What brings us all together is our passion for gliding! Everyone can join and everyone who joins brings in something that makes OGN better and better! With constantly increasing reception coverage we hope to improve safety in the areas where glider traffic interacts with "big" aviation, leading into occasional incidents. Since normally controllers cannot see gliders on their radar screens (unless they are equipped with transponders which is not very common), OGN can propose a good alternative! Last, but not least OGN data can help in SAR actions. The present OGN architecture is set up in several tiers (layers), which interact in various ways. 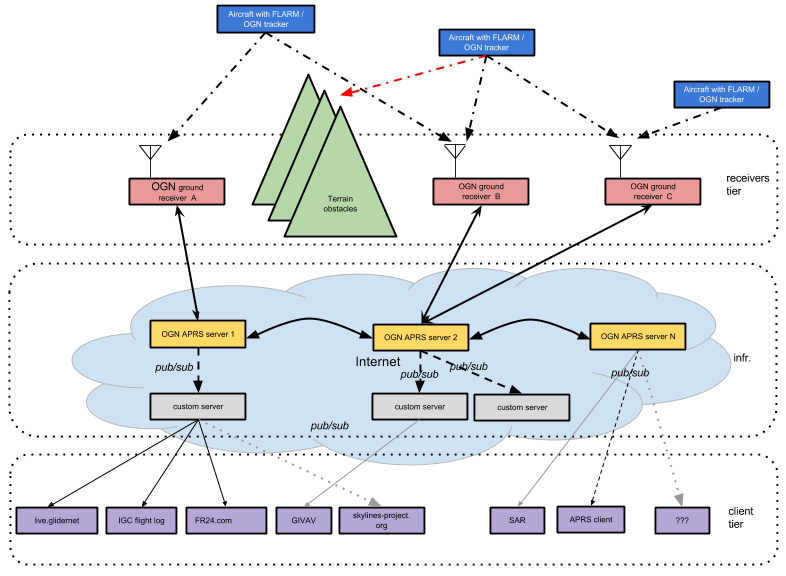 OGN Receiver consist of an antenna, a DVB-T stick and some sort of computer (Raspberry Pi, ODROID, BananaPi, …). Please refer to the OGN receiver hardware section for details. The OGN receiver's antenna receives the messages broadcasted by FLARMs and OGN trackers within its reception range, the DVB-T stick processes them and the computer sends them via TCP network connection to one of the two OGN servers. The Automatic Packet Reporting System (APRS) protocol is used to exchxange data between the receiver-, infrastructure- and client-tier. There is no direct communication between OGN receivers.. All information between receivers is is exchanged via the OGN infrastructure tier. For a detailed description of the APRS messages sent by OGN receivers, please refer to subscribing to OGN data and decoding the data section. As the reception area of two or more OGN ground stations may overlap, the stations must synchronize all received messages in order to avoid multiple separate reports of the same device. The receivers achieve this by constantly monitoring messages received by neighboring OGN receivers. To limit bandwidth usage this monitoring activity is only done and required within a definable radius around each station. By keeping each receiver aware of traffic in its vicinity, duplicate reports about the same device are prevented. You can influence how your glider is displayed in OGN by submitting a record into the devices database. You'll need your tracking device ID. By subscribing your device you can add airplane information that's displayed on live.glidernet.org, or you can opt-out from being tracked. All available information on the OGN servers can publicly be accessed from the client tier without prior user identification. This is used by different client applications to process, visualize and analyze the APRS messages in various ways. Live Web Page visualizes aircraft and receiver positions using map overlays. Only live (certain minimal system inherent time lag given) data with a short-term flight history (flight track) is provided. a .CUP file (with or without a task, but with is better). Flight Log provides a flight log of airflieds with a receiver. If your airfield is missing, you have to ask in the group for the airfield. OGN Range Tool processes all APRS messages into reception range diagrams for each OGN receiver. This tool provides an overview, what areas are already within OGN network coverage. No individual flight are displayed in this tool. FLARM Live Range analyzer uses signal strength data from ground receiver stations of the OGN to analyze and visualize the transmit performance of the FLARM/OGN Tracker installation in your aircraft, also has SAR list. APRSDroid can be easily configured and used with OGN. For SAR and debugging purposes all APRS data is stored. This stored data is not publicly available. If you are a developer and would like to access the OGN data from your own software, please have a look at the Subscribing to OGN Data.